Hao Wu 2P of China is leading the US Open Masters Division this year with an undefeated record of five wins, but the North American professionals are making a fine show with Ryan Li 1P, Andy Liu 1P, and Eric Lui 1P all with 3-1 records. Longtime US Open players Yongfei Ge 7d and Michael Chen 7d also have three wins each. They’ll be back at it Thursday morning with Round 6. Check the Masters crosstab for latest results and top-board game records. Ryan Li prevails over Bao Yun in Blind Go match: Bao Yun showed off his impressive go skills Tuesday afternoon in a Blind Go match against Ryan Li 1p (right). His eyes covered with a rolled-up bright orange 2017 Go Congress staff shirt, Bao duked it out with Li as E-Journal game recorder Dennis Wheeler called out the coordinates of the moves. A big crowd gathered around the game and this year it was also streamed live on the AGA’s YouTube channel with commentary by Jennie Shen 2p, hosted by Steven Hu 6d. 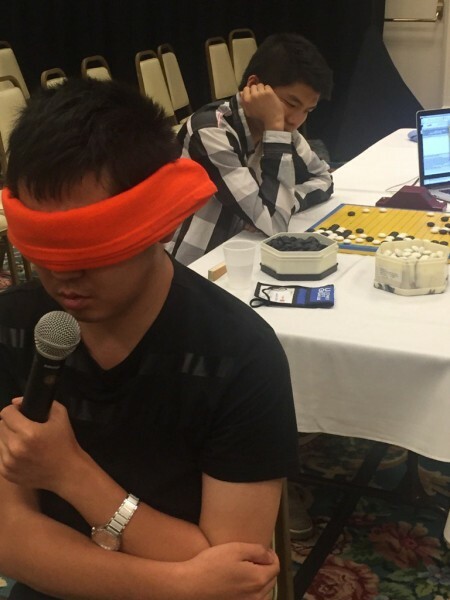 Once again — this was the second year for the Blind Go match — the game was as exciting as it was amazing but in the end Bao Yun ran out of time while trying to break into Ryan Li’s massive moyo. Youth Lightning table winners: Hong Yang 6d, Ben Gong 3d, Sangho Wang 2k, Lucas Lu 9k, Stephanie Tan 10k, ZhongRen Huang 20k. Youth 13×13 table winners: Jeremy Chiu 7D, Tim Cui 5d, Terry Luo 2d, Ben Gong 3d, Andrew Luo 1d, Derek Su 4k, David Volpe 7k, Yulissa Wu 10k, Lujia Chen 21k. Youth 9×9 table winners: Jeremy Chiu 7d, Seowoo Wang 2d, Darwin Kim 8k, Justin Lee 10k, Vedat Veziroglu 12k, Isabella Leong 22k.